BERLIN (Reuters) - They may denounce Vladimir Putin in public but mainstream EU leaders may quietly thank Russia's president for one thing - talk of World War Three over Ukraine could teach voters to stop carping and love the European Union. Eurosceptic radicals, channeling rage against austerity, Brussels bureaucracy and the travails of the euro, will still do well in this month's European Parliament election; but tanks and cruise missiles rumbling across Red Square as armies face off on the bloc's eastern borders may focus voters' minds on the EU's role in defending rights and keeping the peace for six decades. The Cold War-scented crisis over Ukraine has provided no shortage of opportunity for Brussels' critics to deride its lack of military bite and diplomatic cohesion. But mainstream parties hope Putin's reminder of the risks of war and authoritarian rule can give them a late boost in voting for the EU legislature. "My impression is that we'll see vehement polemics against the EU decline significantly," said David McAllister, the lead candidate for the European election in Germany for Chancellor Angela Merkel's Christian Democrats (CDU). 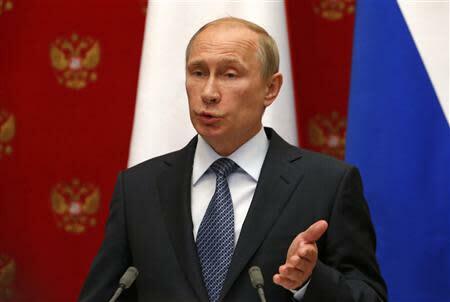 "A lot of people seem to be getting very reflective in view of the alarming situation in Ukraine," he told Reuters. Candidates and campaign managers say Ukraine is an issue in voting to be held in most of the 28 member states on May 25. Traditional parties that have promoted European integration hope the crisis may prompt more of the 400 million voters to choose the familiar over radical change; but a diverse array of anti-Brussels outsiders, such as France's National Front, UKIP in Britain or the Dutch Freedom party, have leapt on the chaos to the east to blame the EU for fuelling the conflict. Oliver Krieg, head of Germany's TNS Emnid polling institute, said it was not yet clear which side would benefit from the crisis but he suspected it would weaken support for the likes of Germany's anti-euro party, the Alternative for Germany (AfD). That is partly because the EU is now seen as a stabilizing factor while the issues championed by the AfD and like-minded parties elsewhere in Europe - giving up the euro or tighter immigration controls - have faded in voters' minds, he said. A dispute is brewing in the AfD over Ukraine - federal party leaders say borders are "not immovable" but this week Bavarian party officials said the AfD should condemn Russia's annexation of Crimea as a breach of international law and call for "an end to Russia's aggressive policies towards its neighbors". Ukraine was one of the central topics during a broadcast debate among the four main candidates to head the European Commission, the EU executive. Centre-right candidate Jean-Claude Juncker told Reuters the idea that Europe was a "peace project" had become relevant again. "For years, I've emphasized that Europe, the European Union, is primarily a peace project and I kept being told that was old talk ... Now we're discovering, in close proximity to the EU, that the issues of war and peace have not resolved themselves." Anecdotal evidence suggests the crisis may be helping mainstream parties like the CDU, which says the amount of hate mail it gets about the EU is on the wane. It may also benefit from party leader Merkel's prominent role in diplomatic efforts to negotiate with Russian President Vladimir Putin on Ukraine. The leader of one Nordic centre-left party said its internal polls showed it made sense at a time of geopolitical uncertainty to emphasize the values Europe stood for, including the peace and security the EU helped foster since World War Two. With Putin overturning years of post-Cold War diplomacy by seizing Crimea from Ukraine and a pro-Moscow uprising in the east of the country, EU citizens "tend to revert to what they know, to feel reassured by the parties that have been there over the decades and helped maintain stability, rather than test their luck with radical or fringe parties", the politician said. Guy Verhofstadt, a former Belgian prime minister who leads the Liberal bloc in the outgoing European Parliament, said Ukraine would be prominent in voters' minds and the onus was on EU member states to stand united against Putin and prevent the country of 45 million people being carved up. "The situation will pressure politicians into working more together on the European level. Not only in foreign policy but also in energy," he said "It shows us in tomorrow's world, a more united Europe is the only way to safeguard our prosperity." Matthias Machnig, election campaign manager for Germany's Social Democrats (SPD), said Ukraine demonstrated the importance of the EU as "a stabilizing factor, a European peace project". Merkel stressed Europe's role as a guardian of peace in her first speech of campaign for this European election: "The whole Ukraine issue highlights the extent of the peace and possibilities with which we live in the EU. On the basis of those reasons alone we need Europe," she said. Jose Ignacio Torreblanca, a senior research fellow at the European Council on Foreign Relations, said foreign policy was clearly more important in this year's election campaign than in the previous vote in 2009 because of Ukraine. This could potentially improve mainstream parties' prospects in the vote. putting together a reply to Putin's actions," he added. Member states are at odds over sanctions on Russia that will hurt national economies in different ways. Governments are also reluctant to squeeze taxpayers to increase defense spending. "At the moment I don't see politicians having the appetite to promise more sacrifices," Torreblanca said. "People have had enough of sacrifices for the last five years." Eurosceptic parties have tried to use the Ukraine crisis to gain support too. Marine Le Pen, leader of France's far-right National Front, said the EU had declared a new Cold War on Russia and Dutch right-wing populist Geert Wilders said of the crisis that "Europe is responsible for a lot of the mess here". The National Front led the contest in France in one survey this week while Wilders' Party for Freedom (PVV) was tied in first place in a recent Dutch poll. In Britain, which votes on May 22, polls indicate the United Kingdom Independence Party could come top with nearly a third of the vote on a platform of quitting the Union. The showdown with Moscow has also featured in campaigning among British parties. In high-profile broadcast debates with London's staunchest pro-Europe leader, Liberal Democrat Deputy Prime Minister Nick Clegg, UKIP's Nigel Farage held up the unrest in Ukraine as an example of dangerous EU expansionism and said the Union had "blood on its hands" for encouraging the uprising in Kiev. Defending the EU as a force for democracy, Clegg seized on Farage's professed admiration for the Russian leader's political adroitness to denounce the eurosceptics as the "party of Putin".